Very close to grocery stores, the beach, and dive shops. Blachi Koko is a very comfortable little set of apartments, in a nice location within walking distance of downtown and a block from the beach. We return there time and again because of the convenience, fair price and really nice hosts and caretakers. I always feel welcome and happy when I visit here. We were celebrating twenty years of marriage while here, and our kind hostess had champagne in the refrigerator chilled for us! The Location is perfect, close to everything, including restaurants, without being right downtown (which is an easy walk or bike-I used the awesome bike supplied by the property) The entire place is immaculate...inside and out! I particularly enjoyed the private outdoor space, table, hammock, big French doors; I enjoyed my breakfast there every morning. The hosts are friendly, helpful and accessible. WONDERFUL. The hosts were very welcoming and helpful. The bedroom has aircondition and there is a fan in the bedroom and living room. There is a very cute common garden. The place is conveniently located, close to the city, to the airport and to plenty of restaurants. 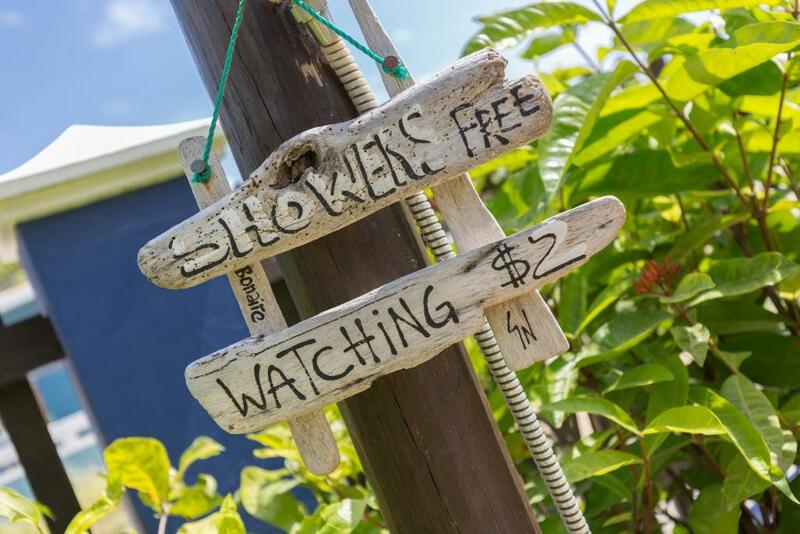 Very clean and a perfect place, close to the sea and with 2 free bikes at the property easy to go to the centre. Friendly owners. Location to beach and town was perfect! Great apartment, has everything you need and it’s close to downtown. We loved the terrace the most! 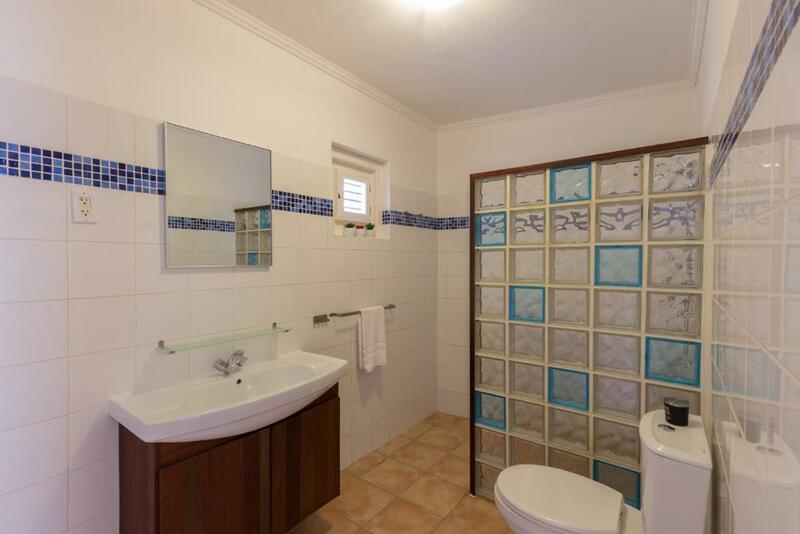 The whole property is very well maintained and super clean. the garden is marvellous, the gazebo, the table outside, the lights and the plants. Just wonderful for spending evenings outside. Also great to have so many things in the appartment, such as coffee, tea, salt,pepper, oil and vinegar, welcome drinks. Felt welcoming! First of all, the host came and picked us up at the airport. As we arrived late, she gave us a quick briefing of what is close to us and what we can do at that time. During our stay, she was all the time reachable and was full of advice and information that we could not find it if we were to search through the internet. The room was clean and all the appliances were very useful during our stay. If you know how to bike, the property has 3 bikes that can be borrowed and used. the location is indeed not in the center, but is not that far away, and you can easily walk there. It is close to the beach and you can enjoy a morning swim or dive, or whatever you prefer. All in all, we had a wonderful stay, an enjoyable host, a lovely apartment and the rest came by itself. Lock in a great price for Blachi Koko Apartments – rated 9.6 by recent guests! Located in Kralendijk, only a 5-minute walk from the city center, Blachi Koko Apartments offers free bikes loan, free airport shuttle and free Wi-Fi. 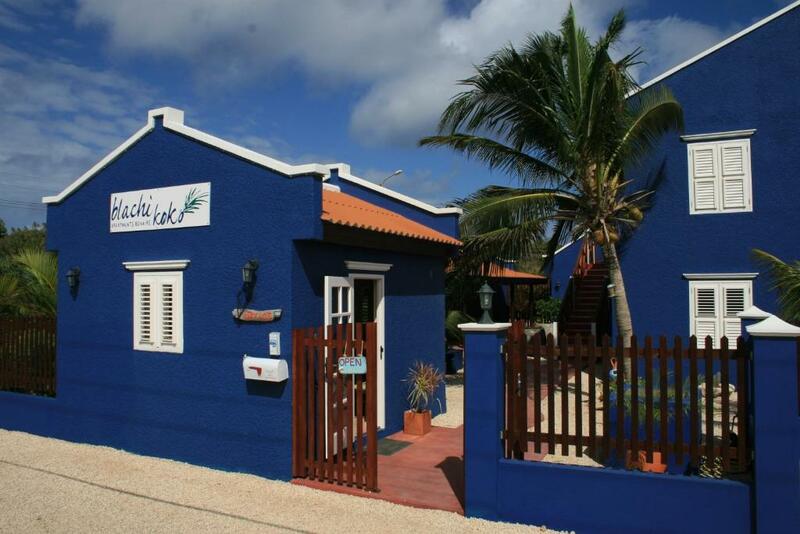 It is located in Julio Abraham, 150 feet from the sea. There is a little beach with easy access for swimming , snorkeling and diving. The apartments offer TV, air conditioning and a furnished terrace. There is kitchen, a seating area and cable channels available. Some unites have a private gazebo and a private patio in the garden. 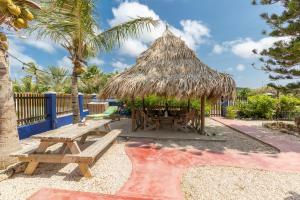 Guests at this property will find a variety of restaurants and bars 0.6 mi away. Flamingo International Airport is located just 1.2 mi away and the Richter Art Gallery is 5 minutes’ drive away. The property offers free parking. When would you like to stay at Blachi Koko Apartments? This apartment is on the the ground floor and offers its own private gazebo in the garden, cable TV, air conditioning and a furnished terrace. The built-in closet includes a safe, plus it also features a fully equipped kitchen and dining area. 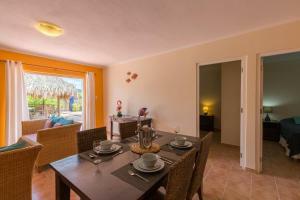 This apartment offers cable TV, air conditioning and a furnished terrace. The kitchenette has microwave, and there is a seating area. This luxurious apartment is located on the top floor and features a large and spacious terrace. This apartment is on the ground floor and features its own private gazebo in the garden. It also includes a built-in closet with safe, fan and air conditioning. 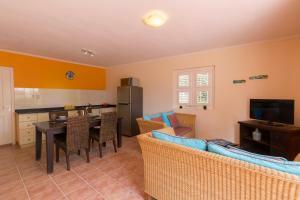 A fully equipped kitchen, dining area and living room with a salon are available, plus a cable TV. This apartment features a kitchenware, seating area and barbecue. Blachi Koko apartments are truly unique...reflecting the inviting influence of Caribbean colonial living, in a private setting, offering a very special alternative to traditional hotel experiences. Laetitia Sernaglia was born in France. She spent most of her youth in the States, and later years traveling the world. Matthieu Foudraine was born and raised in Holland. 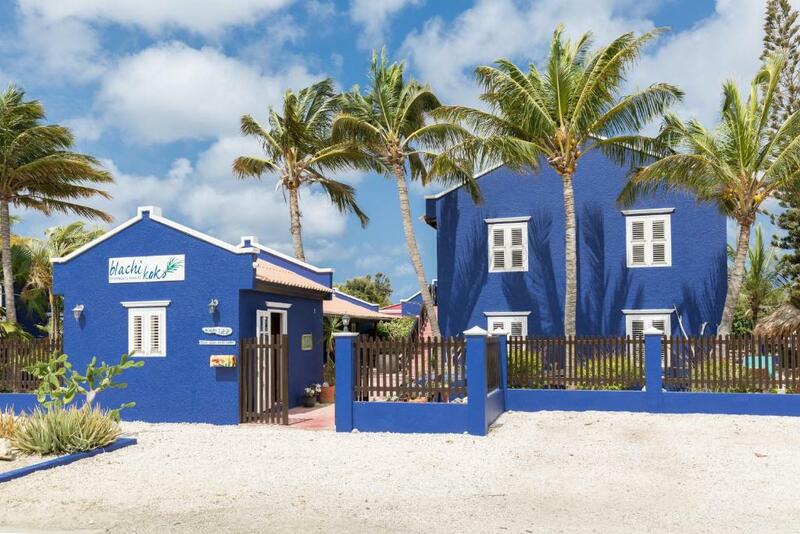 The property is within a couple steps of the beautiful Caribbean Sea ( a little beach great for snorkeling and diving), connections with all our local dive shops, and a 5 minute walk to Bonaire's charming capital Kralendijk. House Rules Blachi Koko Apartments takes special requests – add in the next step! Debit card Blachi Koko Apartments accepts these cards and reserves the right to temporarily hold an amount prior to arrival. Blachi Koko Apartments accepts these cards and reserves the right to temporarily hold an amount prior to arrival. Living room furniture not very comfortable but outside setting very cozy! Internet was intermittent... but hey it’s an island and I didn’t need technology much anyway!! This is the only thing that could be deemed as a issue but it wasn’t an issue for us! The place was like a home away from home! Matthieu and Laetia, they were really nice hosts. It felt like home... Cosy and comfy apartment! Nice place to calm down and relax! There was a very bad smeel coming from the bathroom. After complaining we learned it was the shower. It should have improved after flushing water through the drain. Helped a bit. But the smell always came back. I have no comments on improvement. They do a really nice job. As always, I am sad to leave, but know I will be back. I cannot think of anything that was off during our stay and has a connection with the property. it was great. The host was really friendly and helpful. The beach was great with great snorkeling. The apartment is sufficiently spacious and well setup for a family of 4. Nothing at the property! It was perfect. The location was perfect - walking/cycling distance to town, bars /restaurants and beaches and easy driving to e.g. divefriends to pick up tanks for diving. Great facilities for rinsing dive gear and storage. Car park also really close for loading unloading of dive gear. Little courtyard area outside with table and hammock (1 bed apartment) was really private and lovely to eat and watch the hummingbirds, lizzards and iguanas! The hosts are amazingly helpful with airport transfers and other requests (eg cool box, BBQ, bicycles) and even left complementary beers and a bottle of wine for our arrival. Loved the place and will be back! The security lights stay on all night and are VERY bright on everyone's porch; Perhaps there is a way to have dimmer lights? Mathieu and his wife are the best hosts. They know how to make people feel great during their stay, they went above and beyond to make mine and my daughter’s stay as enjoyable as possible. This place is an absolute gem!